Fill up the Applicant Record Verification form found HERE and press Submit. A link shall be sent to the email you provided which will enable you to continue with your SS Number application. Note: The link shall expire in 5 days and once it expires, you will have to repeat the first step of the registration process. Once the link is clicked, you must supply all the required information. Be sure to review and correct your electronically filled out registration form. Once an SSS Number is already generated, you will need to go to the SSS Branch to correct your information. After clicking the “Generate SS Number” button, the system will display your SSS number and an option to print their ePersonal Record and SS Number Slip. You will also receive an email confirmation which indicates your SS number, a copy of your SS Number Slip and other instruction to complete your application. Note: All the original or certified true copies of the documents you will submit must be presented for verification. 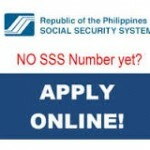 This entry was posted in Application Info and tagged online, sss, sss number, sss online application. Bookmark the permalink.